ADJUSTABLE UPPER STRUT & COIL SPRING LEVELING! 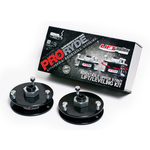 Adjustable front ride height changes from 2.0" to 3.0"
ProRYDE patent pending LIFTmachine adjustable leveling kits are like no other aftermarket leveling solution. For starters, the term "adjustable" means just that. Adjustable. While our competitors provide a "fixed" solution, LIFTmachine is easily installed in the most compact position possible, then simply adjusted to your liking all the way to 3.0". In addition, because it is installed on the top of the strut assembly, there is no spring disassembly or spring "preload" associated with some urethane products on the market today. 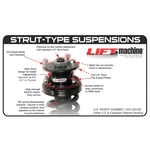 LIFTmachine adjustable leveling kits are available for a wide range of late model light trucks equipped with strut-type and coil front suspensions. And, when installed with our patent pending liftALIGN technology components, the vehicle will ride just like it did from the factory, and without increased tire wear. If you're looking to give your truck that aggressive, level stance and run up to 35" tire/wheel combinations, look no further than LIFTmachine adjustable leveling kits. Why buy a fixed leveling kit when you can install an adjustable LIFTmachine Leveling Kit! An overall lifted appearance at a fraction of the cost of 4-corner lift kits.